O. 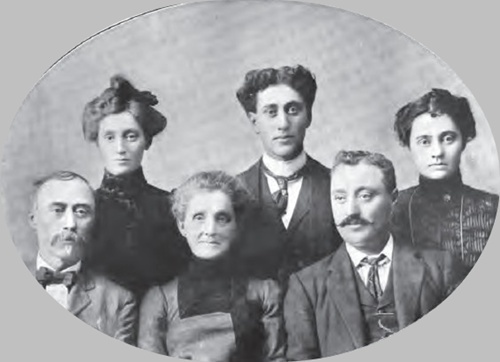 A. Silverthorn and family. O. A. Silverthorne, owning and operating a well improved farm of one hundred and sixty acres on section 9, Grand River township, has been a resident of Adair county for more than four decades and has long been numbered among its substantial and esteemed citizens. His birth occurred in Muscatine county, Iowa, on the 29th of August, 1846, his parents being Richard and Anna Mary (Clendenning) Silverthorn, more extended mention of whom is made on another page of this work in connection with the sketch of E. R. Silverthorn, brother of our subject. O. A. Silverthorn attended the common schools in pursuit of an education and remained with his parents until twenty years of age, when he was married and established a home of his own. Following that important event in his life he operated a rented farm in Muscatine county for two years and on the expiration of that period took up his abode in Madison county, Iowa, where he purchased a farm and resided for six years. At the end of that time he disposed of the property and came to Adair county, subsequently purchasing a tract of one hundred and sixty acres on section 9, Grand River township, the further cultivation and improvement of which has claimed his attention continuously since. He carries on his work in accord with the most practical and progressive methods of agriculture and the well tilled fields annually yield golden harvests in return for the care and labor bestowed upon them. On April 10, 1866, Mr. Silverthorn was united in marriage to Miss Sarah M. Silverthorn, who is not a near relative, their grandfathers being cousins. She is a native of Pennsylvania and a daughter of Oliver P. and Anna (Cashbaugh) Silverthorn, both of whom were born in New Jersey. They removed to Pennsylvania in an early day and in 1855 located on a farm in Wisconsin, while in 1862 they took up their abode on a farm in Johnson county, Iowa. Later they came to Adair county and here the mother passed away, but the death of the father occurred in Canada. To them were born fourteen children, five of whom still survive. Mr. and Mrs. O. A. Silverthorn became the parents of four children, namely: Alvin D., who is now engaged in the implement business at Villisca, Iowa; Mabel C., who is wfe of W. S. Jones of Fontanelle; Olive G., who married Ernest G. Nichols of Bridgewater; and Ernest W., who died when thirty-three years of age. Politically Mr. Silverthorn is a democrat and he has done able service in the capacity of school director. His wife is a devoted member of the Congregational church. They are genial and hospitable people and are held in high esteem by a large circle of friends in this section.